By Keith Cowing on December 2, 2015 11:39 AM. "A NASA Advisory Council meeting is typically about as exciting as it sounds, but the three-day meeting of the NAC now underway at the Johnson Space Center in Houston included a bit of a bombshell from council member Bill Ballhaus. He chairs a committee tasked with looking into NASA's plans to address risks and challenges of the journey to Mars and reported that the committee did not get the plan from NASA it was expecting. "This is not the outcome we wanted. We wanted a plan that argued for urgency but we did not find that," Ballhaus said. "We might as well face up to it." Tom Young asks Bill Ballhaus if Mars architectures available? "I don't know" Gerst says "they are available and are a stack 2 ft deep". Ballhaus says that #NASA has considered exploration reports that go back decades and created the "Evolvable Mars Campaign". Ballhaus: WIthout certain technology we won't go to Mars. 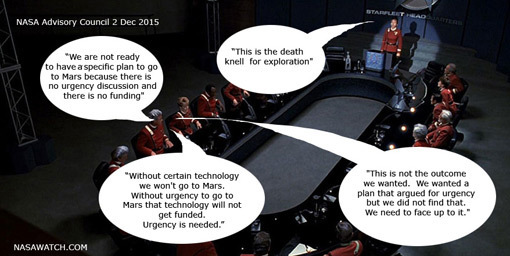 Without urgency to go to Mars that technology will not get funded. Urgency needed. NAC: "we are not ready to have specific plan to go to Mars because there is no urgency discussion and there is no funding"
Tom Young: " #NASA does not have enough info to plan a technology program to go to Mars - period "
Ballhaus: "This is not the outcome we wanted. We wanted a plan that argued for urgency but we did not find that. Need to face up to it." NAC is on a break. If you were listening then you just heard a discussion of the end of #JourneyToMars They do not think #NASA can do it. This page contains a single entry by Keith Cowing published on December 2, 2015 11:39 AM. NASA's Bad Engine Habits was the previous entry in this blog. Hawaiian Court Rules Against Thirty Meter Telescope is the next entry in this blog.